Wilson Ruth and Charles were detained today when they went to sign at the Home Office. They are now on their way to Yarlswood Detention Centre. Please sign the petition to make Amber Rudd look again at their case. This workshop is for people at risk of immigration detention, and for people helping those at risk. Anyone who has not been granted leave to remain in the UK, as a refugee or under any other immigration status, is at risk of being taken and held in an immigration detention centre. This can happen suddenly at any time, but there are certain times in the legal process when you are more at risk. Being in this situation can be very stressful. Being detained can be very traumatic. But there are many things you can do to prepare in case this happens, to make it less likely to happen, to make it less traumatic if it does happen, and to get out and back home more quickly. This workshop, based on the Right to Remain Toolkit, will help you to understand immigration detention, to prepare in case detention happens, to reduce the damage it causes, and will look at practical steps that you can take to help yourself or to help others. 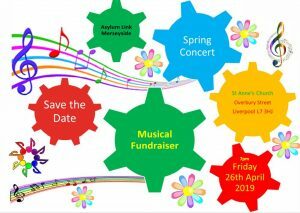 A Fundraiser for ALM with music, stories and food hosted by the West Kirby Methodist Church. A Fish and Chip Supper followed by Music from the ALM ‘Women Together’ Choir, the Borderline Band and others.